Just curious as to who you're saying came here to complain. Same here. I love mine...no issues at all. It does seem to be the norm unfortunately. What I've started doing is taking an ash shovel and scooping the live coals out and placing in my chimney starter to let them burn out. This way, I can clean the Pit Boss and put it away without the long wait. These are great accessories. Right now the only accessories I have are a really heavy duty cover, and grid grippers. I agree with you about not needing to use temp control gadgets as it really hasn't been necessary. Strangely enough, I find it easier to control temps on the K22 Pit Boss, than on my Weber Kettle, even if I accidentally overshoot my target temp. I will definitely be adding the firebox divider, the griddle, and the indirect cooking rack. Thanks for sharing. This past weekend, the weather decided to cooperate, and I was able to get on the grill without needing cover from rain. Anyways, I decided to smoke some wings on my Weber Kettle. The rubs I used were SPG & Bone Sucking' Sauce seasoning & Rub. I smoked these over Pecan wood for about 45 minutes to an hours. Since I did about 30 wings, I left 10 without sauce, and added some Asian Kick Sauce to 10, and some Sweet Baby Ray's Buffalo Wing Sauce to the final 10. These had to have been some of the best wings I've done. Normally, I use Cherry wood, but I've heard that Pecan wood is mild. You could taste the smoky flavor well through these wings. 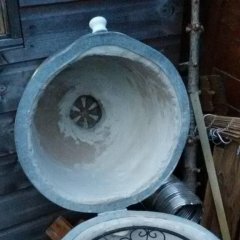 I also like the idea for the ash pan, and I use a small brush and pan that I picked up from a Dollar Tree, to handle the ashes. Initially, I was having issued with settling in on the temp, but I've learned the same thing you stated: use less lump. Thanks for sharing this with us. I recently read that this is nothing new. All kamado owners are encouraged to check the bolts to ensure they are tight. Do I enjoy doing it every time I use my Pit Boss? No...but I'd rather endure having to check and tighten a few bolts than have something fall apart and break. I added some gasket to the lower door and since it was such a tight fit, I trimmed down some of the felt. There's still enough to ensure that no air leaks, I haven't added any to the top vent as mine doesn't really leak any smoke there unless it's right at the start when I get the charcoal going. After a while, it stops. 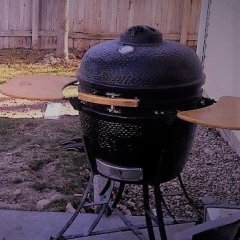 Hey everyone, I've been silently reading posts on here for quite some time in anticipation of purchasing a kamado smoker. About a month ago, I finally got one. 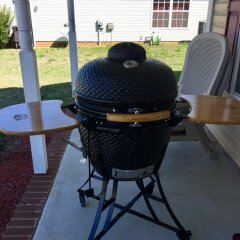 I purchased the Pit Boss 22" smoker and I really enjoy it. 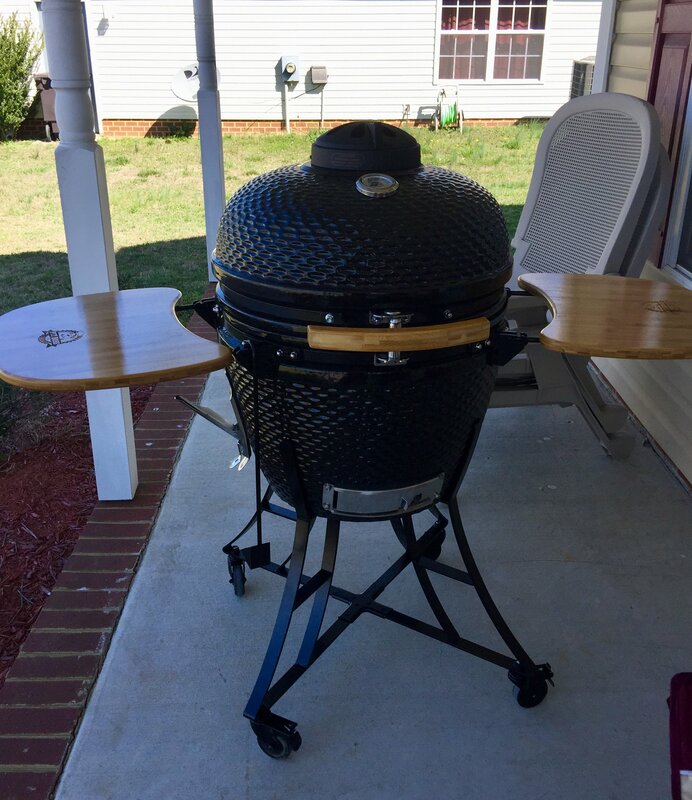 Of the three smokers I have, it has QUICKLY become my favorite/go-to grill. I also picked up a couple of additional items (grill grippers, a heat deflector plate and a cover) as this version didn't come with anything included other than the ash removal tool. So far I've smoked some wings, a ham, and a spatchcock chicken on it and they've come out awesome. Looking forward to learning and sharing with everyone.